Augmentation of the temporal region is a new area for synthetic facial implants. While every other facial implant designed is for bony augmentation, temporal implants provide enhancement of the soft tissue (muscle) region of the side of the forehead and eye. While injectable filler and fat provide a less invasive approach, they do not offer the capability of producing a one-time permanent solution to temporal hollowing. 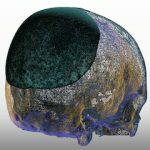 The concept of a temporal implant comes from the historic repair of zygomatic arch fractures. Known as a Gille’s approach, depressed arch fractures are elevated from an incision in the hair-bearing temporal region and approached in a subfascial manner down to the bone. The path of dissection is on top of the muscle but under the fascia. It can be seen with the instrumentation that the entire temporal contour can be elevated from below. Thus it was logical to assume that an implant placed in the same location staying above the zygomatic arch would have an augmentative effect. 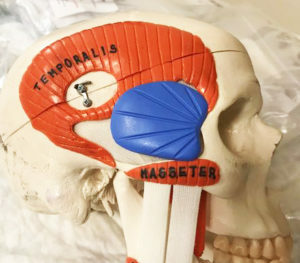 The overlying temporal fascia seems flexible enough and the underlying temporalis muscle stout enough that the implant can push outward rather than inward. 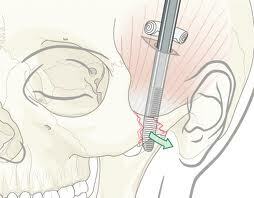 The subfascial plane for a temporal implant is an easy one to surgically approach. And introducing the implant is equally easy. 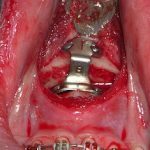 But one question that often comes up is what is to keep the implant from sliding down along the temporalis muscle, below the zygomatic arch and into the lower face? Not only has it never occurred but there are multiple anatomic reasons as to why that can not happen. The first reason temporal implants have pocket stability is the anatomy of the subzygomatic arch space. While the bony arch does create a space or hole beneath it, the actual dimensions of the created space are less than the width of a temporal implant. As the zygomatic arch curves inward to attach to the temporal bone, it narrows the subzygomatic arch space. Thus when looking from above it can be seen that the front to back length of this space is shorter than the anteroposterior length of a temporal implant. The second bony reason is the location of the coronoid process of the mandible. The tip of the coronoid process acts as an inferior stop as it juts upward into the subzygomatic arch space. In addition, onto the coronoid process are the funneled attachments of the temporalis muscle which also creates a soft tissue block. For these anatomic reasons the temporal implant is prohibited from falling downward into an unintended anatomic location. The surgeon should feel comfortable making a pocket that is felt to be best for implant placement without this concern.